I didn’t think about it until now, but it’s kind of strange that we wear bands on our wrists to tell us how many steps we’ve walked. In fact, most of the activities we track from up high tend to originate from below the waist. San Francisco-based Flyfit has thought about this a lot more than I have, and just launched a Kickstarter campaign for an activity tracker that straps on to your ankle. The Flyfit reminds me a little of the Core activity tracker that Sony(s sne) introduced earlier this year at CES, in that the device itself is just a small tracking unit, but it slips into wearable band. The big difference here, though, is that you wear the Flyfit around your ankle. I love the color choices, which include black, cyan, fuchsia, white and yellow. The tracker features an LED panel with four symbols to represent each of the main tracking functions. 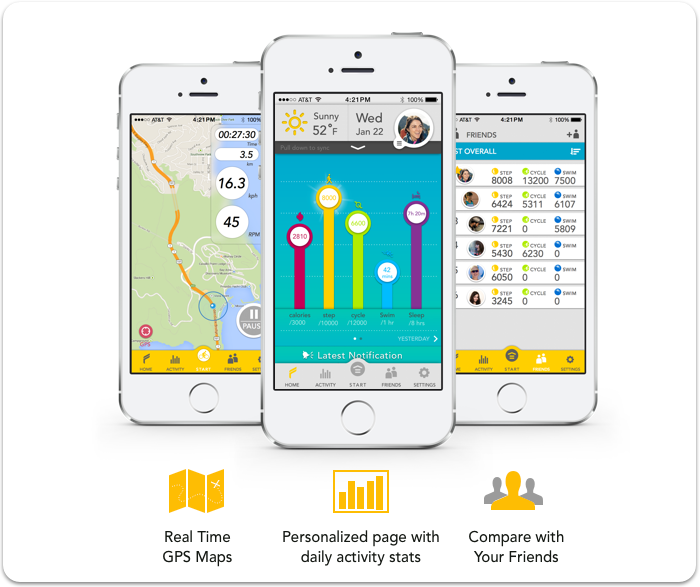 Daily activity tracks cycling, running, stairs and walking. Sleep, swim (Flyfit is waterproof) and battery are all pretty self-explanatory. According to Flyfit, by placing the tracker on your ankle, it enables the device to automatically differentiate between fitness activities. Whereas wrist trackers measure vibration for wrist position, Flyfit tracks and measures leg movement, which allows it to pick up on activities that most wrist-based trackers can’t measure, such as cycling and swimming. Flyfit is being developed to work with Apple’s(s aapl) iOS — Android (s goog) support will come if Flyfit surpasses its Kickstarter goal — and the device will sync automatically with your phone or tablet via Bluetooth 4.0. Flyfit doesn’t show any stats on the device itself, but a companion app will provide a detailed readout of your activity in real-time. I love getting a real-time update of my activities on certain machines as the gym, so I think placing that kind of functionality right on the screen of a connected device can be really helpful. And Flyfit can work in conjunction with your phone to bring you a live GPS, as well as measure the speed of your steps and cycling. Aside from Flyfit’s claim that placement on your ankle makes for more accurate tracking, this band solves another problem I find nearly as important. I’ve worn my share of wrist-centric activity trackers at this point, and I just don’t find any of them to be attractive. I don’t really mind wearing one when I’m on my way to the office or the gym, but I’ve been known to slip them off before a night out on the town. And don’t get me started on formal events. The beauty of the Flyfit is that no one has to see it – provided you’re wearing pants. But even in shorts, I find the Flyfit slightly less offensive than trackers worn on the wrist. To me its placement on the ankle speaks more to utility than a fashion statement. Flyfit is looking to raise $90,000 in funding by March 25. The campaign just went live today, and at the time of writing has surpassed $7,000. 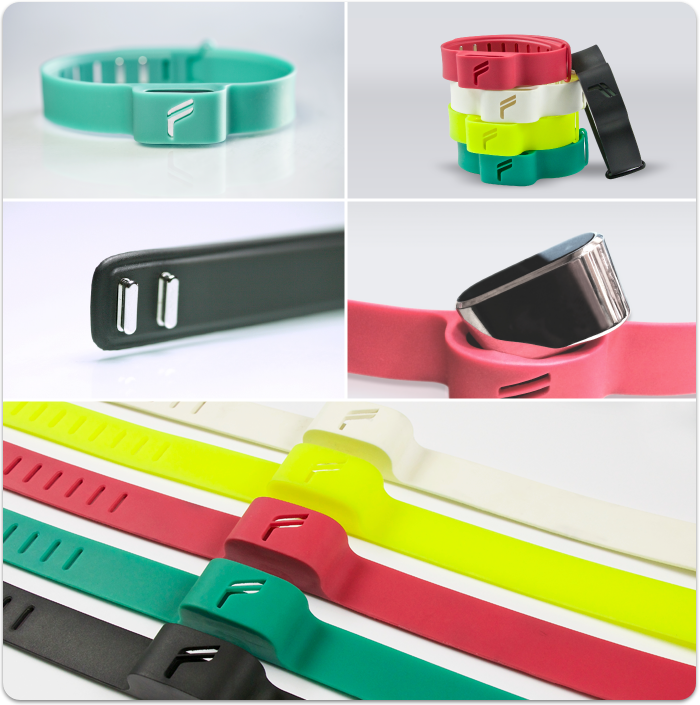 You can still get in on an early bird deal that’ll get you a Flyfit tracker and two bands in the colors of your choice for a pledge of $89. Once that runs out it’ll be $99, and the estimated retail price will be $139. Provided the project gets funded, Flyfit estimates delivery by August. This sounds great, except for one thing – What’s with the clasp? Everybody hates them on the Fitbit. Isn’t there anyway to use a more standard kind of clasp or band? Fitbit Force, Fitbit Zip or Fitbit One, Jawbone UP24, VÃ­vofit by Garmin and several others but like the Flyfit better than all of those. I am an Android user else would have immediately backed the project. They do have Android version, you can check their KS page.